I took two days and cleaned, decluttered, and reorganized our entire apartment from top to bottom and MAN did it feel good. Since having a baby, our apartment has taken a bigger hit than I would liked to admit and I made it one of my resolution to find a way to adapt our new life with a child (and all the things that come with him) with our once tidy and organized life. It is by no means a perfect system, but thanks to Marie Kondo, I have stepped up my organizational skills to the next level and reorganized all of our baby stuff. Before I get into the good stuff, lets do a quick recap of the Marie Kondo tidying method, KonMari. By going through your belongings in this order it helps you see results and continue to push on through to the end. By sorting in categories instead of location, it also prevents rooms from getting dirty again before you’ve fully finished your tidying. In the show and the book, Marie Kondo shows you how to fold your clothes to maximize your space and keep things looking tidy and organized. This one was so satisfying to complete. It was a great time for me to go through all the clothes Rhys got for Christmas (I know, I’ve been slacking on the cleaning lately) and to pack away all the clothes that no longer fit him to make room for the new stuff. For the stuff that no longer fits Rhys, I didn’t want to get rid of them because I’d like to reuse them for future children. Marie Kondo suggests storing items in clear bins to help you quickly locate what you are looking for when you need them again. 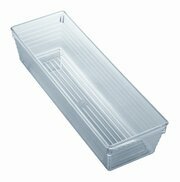 I used some of these clear storage boxes from Wayfair and they’re awesome! I can store them in his closet or under his crib and they fit all his clothes in them. I organized them by age and stuck a piece of paper in the top of the box so I can easily identify which is which. Since his bed linens and blankets were different than our own stuff, I wanted to keep them separate to make the late night crib sheet changes as easy as possible (we’ve all been there, am I right?). The KonMari method says to fold and store them like you would with clothes, folded in three and placed standing up. 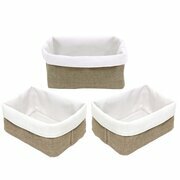 I used these fabric storage boxes that I already had at home but these ones from Wayfair are almost identical! This was probably the only area we didn’t need to declutter but I wanted to show you how we’ve been storing Rhys’ books in his room (not KonMari style, but still cool). I saw this idea on pinterest when I was putting his nursery together and I fell in love instantly. We created a library wall for him so as he gets older he will be able to see all his books and pick the ones he wants to read. 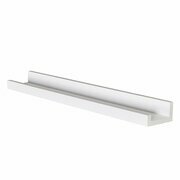 We used the picture ledge from Ikea in white. They were super easy to put up and are very stable on the wall! If you want to keep your shopping trip to one store, you can get these exact picture ledge on Wayfair. I knew it was unrealistic to think we’d have a house that didn’t have toys and baby stuff scattered everywhere, but I was shocked with how much stuff you actually accumulate once you have a baby. When I say there is stuff everywhere, I mean there is stuff. every. where. It’s incredible how such a tiny human being needs so many things! Our issue was not with the amount of stuff we had, because although there was a lot, it was only what we used and needed. My problem was how we were storing them. They were tucked in corners, jumbled and thrown in old gift bags, or just put on the floor. Since we use most of the items on a daily basis, it didn’t feel convenient to put them away in a place that would be out of the way, so I hid them in plain sight. Under our TV stand in fabric boxes. It was the perfect place for them! It’s in the room we spend the most of our time in, and you can’t tell there are toys stuffed in them. Our changing table is great. It is super open and everything is very easily accessible. The only down side to it is the ability to keep it organized without any external items. To solve this problem we put storage boxes (the same ones as we used for our linens) on the shelves and stored our diapers, burp cloths/ wash cloths, and swaddle blankets in them. These are our most used items on a daily basis so organizing them like this has been awesome. It’s easy to reach under with one hand to grab what you need and keeps everything looking tidy. I folded all our blankets and cloths the same way as the linens and stored them upright so the items are easily accessible and can hold the maximum amount in them. We used a storage box which wasn’t as deep for our diapers so to make grabbing them easier. I love these ones! I plan on ordering them for Rhys’ room to replace the current ones we have to bring a more cohesive look to is room. I hate to admit it, but this section was added in last minute after I had finished putting away the weeks groceries.. I was horrified at the state of our cupboards and how we were storing Rhys food and utensils. There was stuff thrown everywhere! Nothing was together, food was put where ever there was space and it was stressful just thinking about it. I ended up going through our kitchen cupboards and purging a bunch of old food and bought some plastic organizers so that I we could start grouping like foods with each other to form a system. I couldn’t find the exact ones I had so the ones I linked are similar. I can’t even explain how good it feels going into the new year with a clean and organized space. I have big goals and aspirations for 2019 and the last thing I want to worry about is the clutter around my work environment! A clear home equals a clear mind, for me, so reorganizing has made it much easier to work. Not to mention, being able to order everything off of Wayfair and never having to leave the house is even better! I know I’d be running around all day if I were to go out and pick these items up in store. We have furnished a bunch of our apartment with Wayfair items and have been nothing but pleased with their services. If you are looking for new ways to organize your space, hopefully this helped you! Check out below for a full list of items I mentioned in this post. I love this! Your organization looks so good. 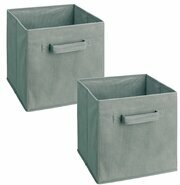 We’re planning to get a bunch of bins from Costco to organize our linens and purging our clothes. Tidying up has been a slow ongoing process in our house, but we’re making progress. Great post, the title is awesome! I love the photo of your little guy! I just started watching Marie Kondo on Netflix and it’s so good! I didn’t expect it to make me cry…but I am sappy that way. Thank you so much! I totally agree about the crying.. I did the same 😂 it’s hard not to when you see the changes in their lives!